Around here, the first Spring vegetables are those (if any) that survived the winter. In a warm year, a few greens – broccoli rabe, chard, kale – and leeks. (In a cold year? Nothing until May, at the earliest…) And sometimes radishes, which grow so quickly. I wasn’t sure how that would work, this year. Most of the winter was very warm – the kind of year when we do have stalls full of greens in March – but there was that one spell of bitter cold, which I was afraid would be just enough to freeze anything the farmers were cossetting along. Apparently, though, some plants were able to survive. Well – at Greenmarket the other day I wasn’t desperate enough for fresh greens to buy a bunch of four leaves of chard for five dollars… but that was the exception. I did get a decent bunch of mizuna, I admired radishes but didn’t get any (and came home to find a recipe for roasted radishes. Next time!) I bought the usual winter fare of apples and turnips. But I also bought leeks! These aren’t the slender, tender leeks I’ll happily grill in a few months – these are tough old veggies that have survived the winter buried in their sandy trenches. The farmer has chopped off the dried, frost bitten leaves, and trimmed off the wilting outer layer – but oh, my, these are sweet… Wonderful flavor! When I wrote about Creamy Corn and Leek Soup, I discussed cleaning leeks – and that I routinely clean and saute the whole bunch at once. 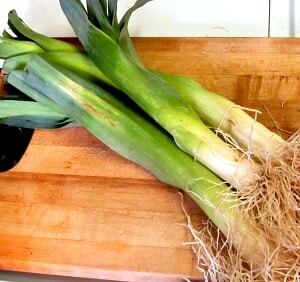 One of these is usually more than I want to use to feed just two of us, and as long as I’m fussing with bowls of water I may as well deal with it all – and it is so convenient to be able to pop some already cooked leeks into a pan to start a meal! 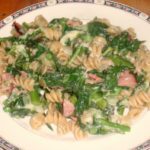 And in fact, this recipe could be made with either the fresh leeks, as I did here, or with precooked ones – in which case you could cook the whole thing in about ten minutes. I actually sliced and cooked three leeks, then reserved about two thirds of them… I used enough leek here for it to really be a vegetables, not just an aromatic. So I’m writing the recipe as if you are starting with one leek and half a pound of chicken breast in one chunk, because in fact you might be – but remember you have the other option. Trim the roots and the coarse leaves off a leek. (I reserve the leaves for later use in broth, or as a flavoring with meat – too fibrous to eat, but the flavor is there. Just toss the roots, though.) Cut the leek lengthwise, then slice across – this is the easiest and most efficient way to get rid of any sand that may be buried in the layers. Place the pieces in a sink or large bowl of water, and run them around to separate them, and let the sand settle. (If they are very sandy, I may give them a second rinse – I don’t want any grit in my dinner!) Then drain. And there you are. I served over rice, with a side vegetable, and it was a lovely dinner. 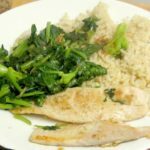 Now remember – if you get home and it is dinner time, but you are prepared… Set your pan over heat, and take the leeks and the chicken out of the freezer, and rice out of the fridge. (Or if you have a lovely rice cooker like mine, maybe you set it up with the timer and you have fresh rice?) Heat a little oil, drop in some of the frozen leeks and stir around. Take out enough chicken for your family, let it thaw a little on the cutting board while the leeks heat up, then separate the pieces of meat, drop them in the pan, and proceed from there. Microwave the rice, and maybe a frozen vegetable? Dinner in the time it takes the rest of the family to put away coats and set the table… and a rather nice dinner, at that. 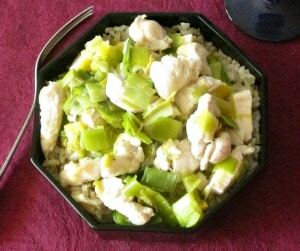 Over wintered leeks with chicken - some of the first fresh vegetables of Spring, served with mild white chicken for a quick and delightful dinner! Trim, cut up, and wash the leek. Drain. 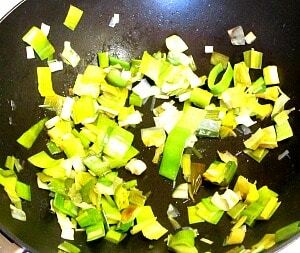 Heat oil in a saute pan, and add the leeks. Saute until soft and beginning to brown. 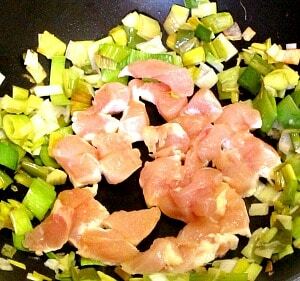 While the vegetables cook, cut the chicken breast into bite sized pieces. Add the meat to the pan, Saute until slightly browned, then add 1/4 water or broth, and seasoning, Bring to a simmer, cook until chicken if fully cooked, about 5 - 8 minutes. This looks great. I happen to love working with leeks. It may sound odd but I just loving slicing them for some reason. 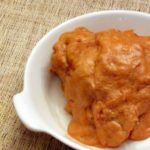 They do go well with chicken...great recipe!! LOL... They do fall into nice little rings, don't they? I only started cooking them relatively recently - and I love them! Such a wonderful flavor. 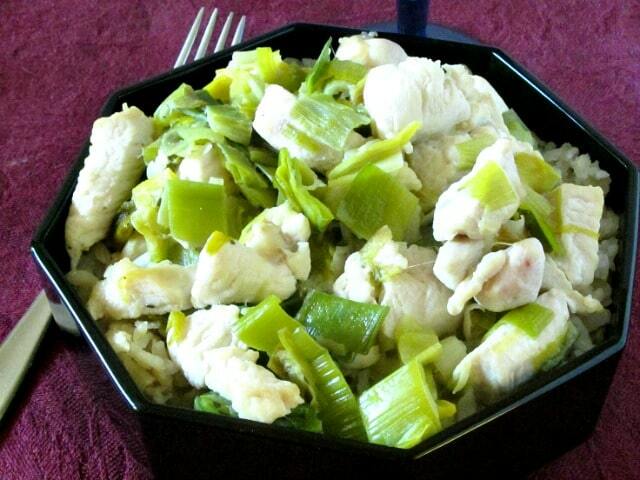 i like to dice or slice chicken and freeze it for later use during the week...i have not really cooked leeks with chicken but do enjoy recipes with it. It's so much easier, isn't it, when it's already cut up? 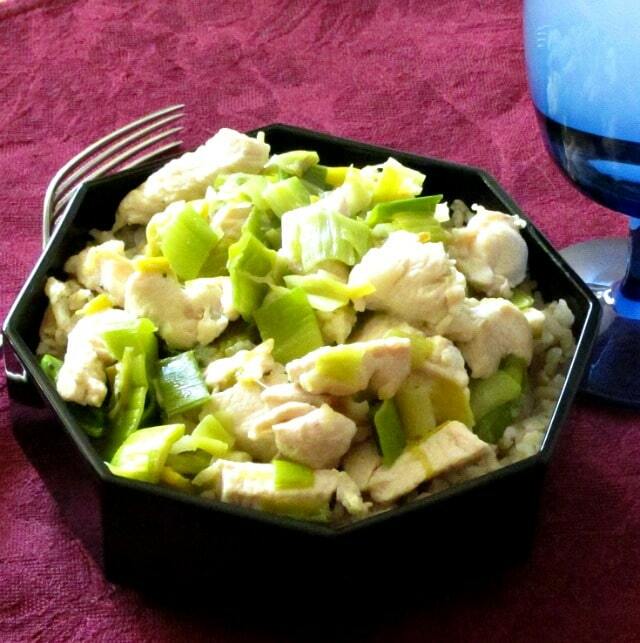 If you enjoy leeks, do try them with chicken - they're a great combination! Thank you! Getting the prep work done in advance makes dinner so much faster and easier... and there are days I would not be able to cook otherwise. I do miss leeks this spring. My hubby forgot to plant his leeks last fall! I'll have to go see what the grocer has! They are a bugger to wash but the flavor is so good. I love leeks in recipes like this! Thanks for sharing! How lovely to have them that fresh, when you do get them! I've really only started eating them much in the last few years, and I've been missing a lot! They really are delicious. These weren't fresh spring leeks, though - too early for that here, still. These were the big, fat, slightly coarser ones that have survived the winter in their sandy trenches. And the washing is one reason I've taken to doing a whole bunch at a time - as long as I'm fooling around with a whole sink full of water, I may as well get it Done! We like this combination! And we're also big fans of make-ahead and cook/reheat when ready. Save tons of time. YUM! I love it when leeks come into season. Looks delicious! Thank you. I was so excited to find the leeks! Thank you! And yes, I have good food, I want to taste it. I don't mean I won't season, or that there isn't a place for a complex braise, but sometimes just letting the flavor of fresh vegetables shine through makes a meal perfect. I'm such a fan of leeks; such a delicate and wonderful flavor. Love when they're a main ingredient instead of a supporting player. Great dinner idea! Thank you! I admit I sometimes just use leeks instead of onions, but they do have so much more to add! Thank you - it was! 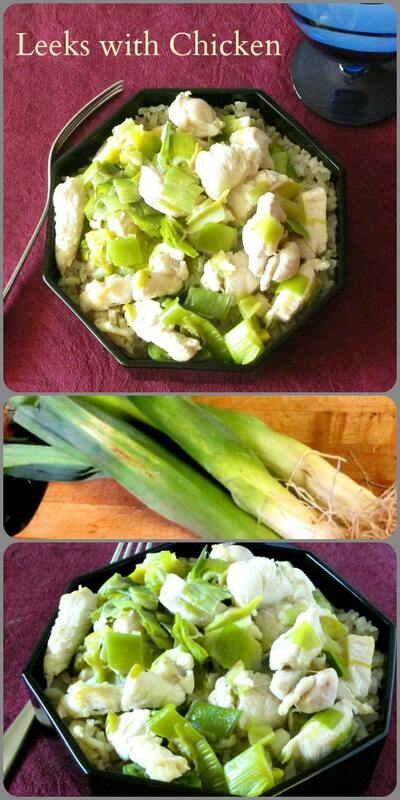 I love leeks - I bet this dish has wonderful flavor! What a lovely, simple and flavorful dish! Right. I used to sort of bury them. Oh, I can use them like onions... I still use them that way sometimes - subtle but nice difference - but I really like featuring them, and really tasting them clearly! Thanks!